Our comfortable furnished apartments - 8 single- and 8 double-rooms and separated by smokers- and non-smokers rooms - we are able to offer a place to stay overnight for up to 30 guests. Your dog or other little pet is also welcome. You can find parking slots for cars and busses next to the hotel, a garage is available for extra charge. In summer we like to invite you to our swimming-pool for a refreshing bath outside. All rooms are arranged with bath or shower, WC, partially with mini bar and telephone-extension. 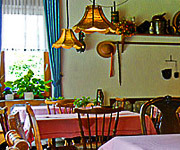 Here you can enjoy a delicate breakfast in the morning or homely hours in the evening.